ancient name for the land that lies between the Tigris and Euphrates rivers (in modern Iraq), from Greek mesopotamia (khora), literally “a country between two rivers,” from fem. of mesopotamos, from mesos (μέσος) “middle” (see: medial (adj.)) + potamos (ποταμός) “river” (see: potamo-). In 19th century the word sometimes was used in the sense of “anything which gives irrational or inexplicable comfort to the hearer,” based on the story of the old woman who told her pastor that she “found great support in that comfortable word Mesopotamia” [Brewer’s Dictionary of Phrase & Fable, 1870]. The place was called Mespot (1917) by British soldiers serving there in World War I. Related: Mesopotamian. 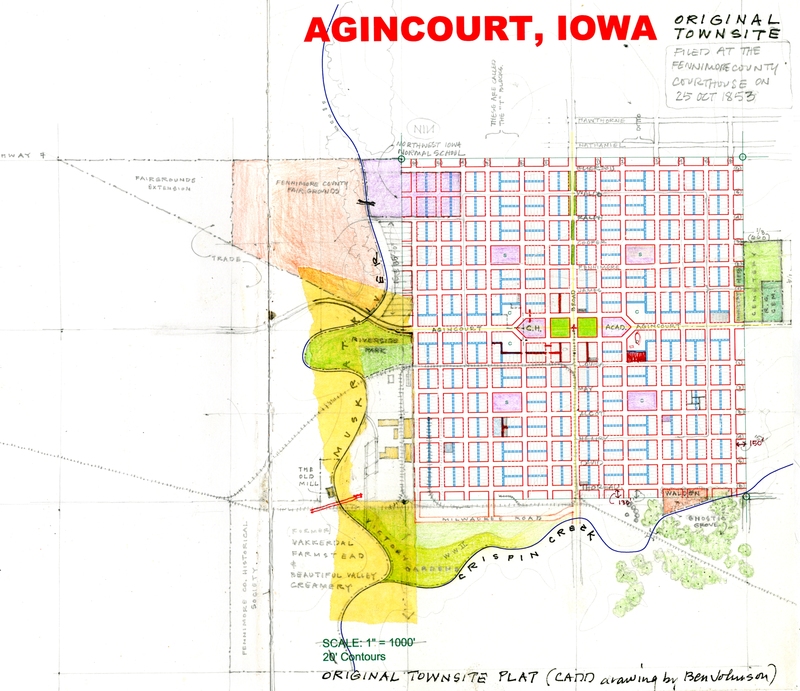 Agincourt’s original quadrants are identical in pattern—each of them mirrored on the opposite side of both Broad Street and Agincourt Avenue; that is, symmetrical north-south and east-west, a higher degree of cartesian balance than even Philadelphia—but they vary in topography. They were also settled at different rates and times, achieved different densities of population, and attracted different residents. As you might guess from this plat, the southwestern quadrant was subject to flooding, situated as it is at the junction of Crispin Creek with the Mighty Muskrat. A working class neighborhood, where blue collar folk lived near their places of employment—the railroad, lumberyard, canning factory, etc.—residents knew it as “Mesopotamia” (a veiled reference to the ancient Middle East and our own counterpart to the Lower Ninth Ward) and established a micro-culture unlike other parts of the city. Howard told us about errands to the FFC Market, of its proprietress Fern Pirtle, and the source of his first dog Frank. But aside from the market, the Syndicate Mill, and Anton Krause’s first foundry, not much has been written. Time to remedy that. Post Script: Cities are organic creatures, growing as they will, often in spite of our best efforts to direct their progress, and despite any egalitarian tendencies, they are disinclined to uniformity in almost every respect. Very soon after platting and the sale of lots, each quarter of the original Agincourt townsite attracted a different clientele. So the northeastern section, because of its slightly higher elevation, became the neighborhood of affluence, while flood-prone Mesopotamia in the southwest received little attention—especially during actual flooding. The squeaky wheel gets lubed and we know who’s in charge of the oil can. Somewhere in the accumulating Agincourt detritus there is postcard I purchased long ago (found it! above) of what I can only describe as a humble group of totally unassuming structures, which immediately struck me as the character that likely developed in that “land between the rivers.” It’s good when you can find some of the designing already done by others. By agincourtiowa in Uncategorized on Saturday/21/April/2018 .